It's Hip 2 Serve! 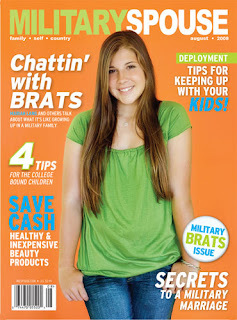 : Military Spouse Magazine-only $1.66 per issue!! For those of you that are not familiar with this magazine, it was created by military spouses in 2004 and is currently the only print magazine available for military spouses of various branches of service. The magazine provides advice & tips regarding relationships, financial issues, career questions, family life, deployment etc. You can order 12 issues of this magazine now for only $19.97 (that's only $1.66 per issue!). Click here to order a subscription (enter "Military Spouse" in the search bar). Happy reading!